Yes, I live with a twoligan. My two year old basket case, a ball of fury and excitement and ALL OF THE EMOTIONS. Reason isn’t big on his agenda, neither is the idea of doing things quietly or gently. He’s becoming a proper little person, forming sentences, realising social cues. He has days where he is the ultimate charmer, days where I’m seeing his teenage years approaching with alarming speed, where he flirts with women on the bus, is affectionate and loving and talkative to everyone in a slightly bordering on aggressive way (we’ll have to work on that, some people don’t want to talk love). Other days, the dictator side is much more apparent. He’s moved into the next room in creche, he’s now the small fish in the bigger pond instead of being one of the older kids. He’s learning new things, interacting with different kids and learning different things about how different people act. It’s all a massive time of transition, and as expected, it doesn’t all run smoothly. Some days he bounds out, thrilled, caked in compost from head to toe and sticky from his bread and jam snack. Other days he is more solemn, the day has not gone his way, thankfully those days are much rarer. He’s got friends of his own who he talks about at home, a new way to play, sometimes even (rarely) without destruction. He’s now there full time in preparation for my imminent return to the workplace. Which he’s loving. Thankfully. We’re just about ready for toilet training. The underwear (Paw Patrol, of course) has been purchased, he’s used to the seat and the step in the bathroom, he’s starting to remove his nappy and run in there on his own impetus. If anything it’s me holding back, not him – on one hand, yay to the end of nappies, on the other, how is my skinny child going to keep his trousers up without the bulk of a nappy? It’s the putting aside of time to start him properly, it’s on the soon to do list, we’ll get there soon. I’m not sure I’ve felt this tired before. I know I have, I have a record of those newborn days, but it all feels so long ago now. He was a sleeper. Much as he used to wake once or twice a night, it was an easy shush back to sleep job. This is new. This is up in the middle of the night, as if powered by red bull, bed bouncing, running around the small apartment, making enemies with our upstairs neighbours for sure awake. Last night was not the first night of watching Bob the Builder at 4am after failed attempts to soothe back to sleep. Aside from the sleeplessness at night, it’s the days that are the truly exhausting part. It’s non stop. I look at people who have multiple kids and am in absolute awe at how they are still standing. Full time creche is a godsend, it allows a semblance of normality (and the inevitable guilt of “I am missing his formative years”). The weekends are high octane, long hours of constant choruses of “Maaaam”, “Noooo” and “Get down! !” (That one is both me and him, he likes to shout it as he climbs up too high to a dangerous ledge at the back of the sofa to jump down). He doesn’t know what he wants, but he knows he wants it now. A constant buffet of snacks, and the dinner from someone else’s plate. All on his terms. I feel I should be in control. And then feel like I’m drowning just a bit. The Mammy guilt part of me shows me all the other Instagram friendly parts, the parents with obedient, loving children. The sensible part, which lets be honest, takes a holiday after lack of sleep, tells me that anecdote about toddlers being like a blender without the lid. These are the days described as the terrible twos, I know, but it just feels that it’s me, not him, that’s the problem. I’m working on it. Trying to breathe through the moments where I feel like screaming. Getting in lots of walking. Avoiding the comfort eating. Trying to constantly remind myself that he’s not doing this deliberately to annoy me (mostly), he’s just working through his stuff and these effects are a crappy byproduct of that. The days are long but the years are short. I know I shouldn’t be wishing the time away but it is difficult not to. Things like that horrible tragedy in Florida happen and I hold him close and thank every tiny thing in the universe that I still have my two year old to love and hold and curse at his sleep depriving ways. But at the same time, as grateful as I am that he’s safe and healthy, there’s a part of me yearning for days of freedom, of days without worry and guilt and days starting with a kick to the face. It’s a stick which I can beat myself with, and do quite regularly as a matter of routine rather than deliberate intention. I look for the “one day” of becoming this zen mother who can handle everything life throws at her and hope it will be today, or tomorrow, or at some point in the next 16 years, so that I can enjoy this parenting thing while my son is young enough to be parented. It’s not that I don’t enjoy it – there are days where I realise this is exactly the life I want, happy child, loving family, everything going great, but it is the fleeting nature of these moments compared to the seemingly ongoing drudge of sleepless nights and tantrums and horrible nappies and having to play bad cop to the toddler who only wants his Daddy. It’s hard. I’m trying to keep a track of my own mental health and balancing the need to be a good Mammy and also a good person to myself; sometimes the two simply don’t correlate. I curse myself for still depending on medication, prescribed by my doctor almost 2 years ago, to get through the day without reaching the same emotional state as the toddler. It shouldn’t be this way, it shouldn’t be this hard. But it is, and I have to learn to live with that. I’m working on maintaining control over my tiny dictator, my twoligan and getting there day by day. Roll on the days of a threenager, for a bit of variety if nothing else. In control of the remote, much like everything else. BadMammy is also on Facebook, keep up with the sleep deprived ramblings there! 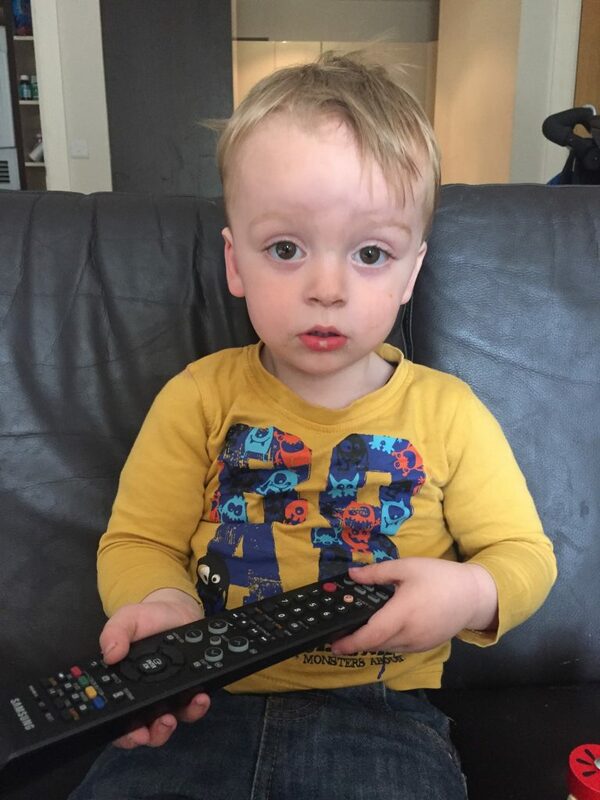 My 18 month old seems to have got the terrible two’s early and is testing the boundaries a lot. Some days can be so trying. We are living the same life. The same toddler life haha. 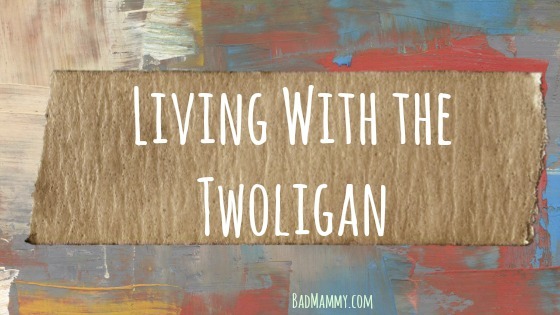 Two Twoligans. I’m so bot ready for potty training. I’ll be watching you closely… And following your lead and tips. I actually dread it!! I am glad I am out of that stage with my 3, the twins kept me on my toes and gosh it was hetic! However as they get older it is just a different set of interesting behaviors to deal with!